We’ve eaten at a LOT of different places since we moved to Memphis, the majority of which were chosen by me because they were on my Food Bucket List. So when Tammy’s birthday rolled around this week, I told her we could go to dinner wherever she wanted, even if it wasn’t on my list. She researched for a few days, scouring Memphis for more upscale places than we usually frequent, and finally settled on a restaurant in downtown Memphis called Flight Restaurant & Wine Bar. Flight Restaurant & Wine Bar in downtown Memphis. Flight not only offers flights of wine (three 2-oz. servings), but they also offer flights of appetizers and meals. 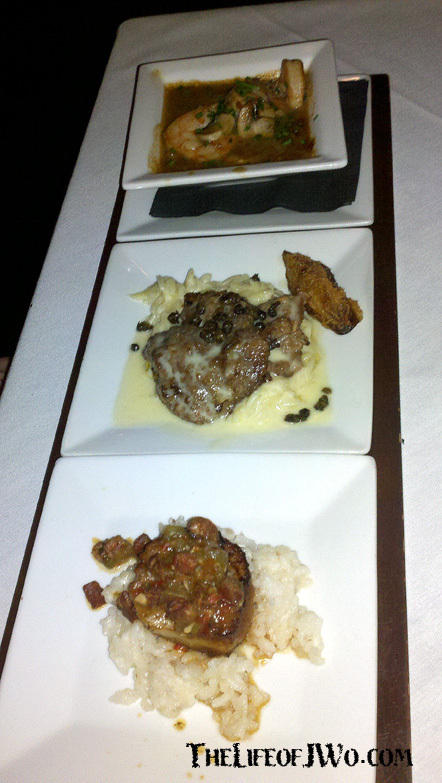 Each flight is comprised of 3 smaller portions of different foods, sharing a theme. For example, the Ocean Flight appetizer has lobster, crab cakes and coconut shrimp. The entrée range from fish, steak, feathers (chicken), tenderloin (pork) and seafood. You can order the “flight” from the menu or mix and match to make your own 3-course dinner. Larger portions of single items are also available. We had walked by Flight during one of our many trips downtown, so it wasn’t really a surprise to me that she wanted to go there. She sent me a link to their menu (she already had picked her meal out) so I made reservations for us online. We arrived 30 minutes early and planned on having a drink at the bar, but instead we were seated right away. Our waiter, who called me Mr. Wommack throughout the night, explained how the flights worked and described the specials. Tammy ordered the A.B.C. Wine Flight which consisted of three 2 oz. 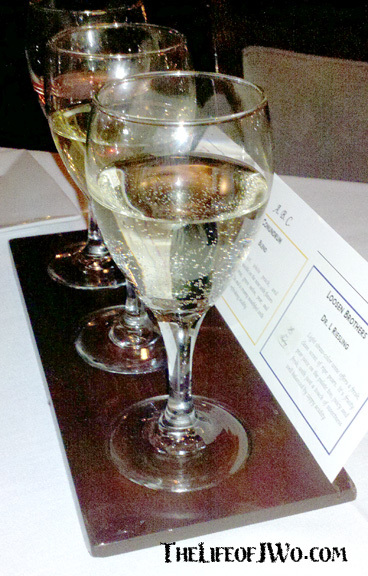 of Belle Gros (Pinot Nior Blanc), Conundrum (White Blend) and Loosen Brothers (Riesling). 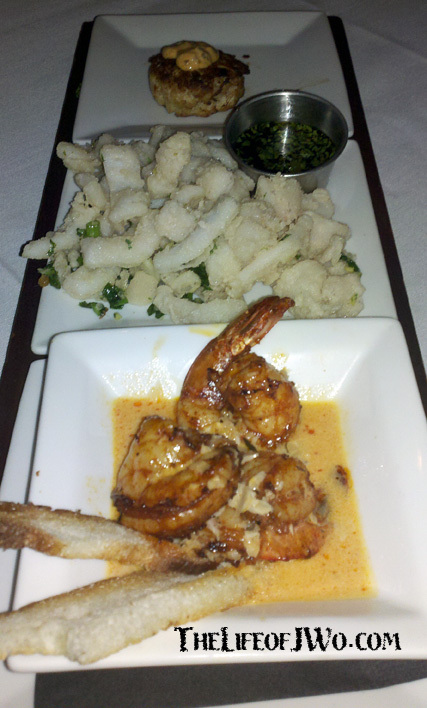 We ordered the Chef’s Special appetizer, which came with two crab cakes, rice-battered calamari (which was the best calamari I’ve ever eaten) and three BBQ shrimp. 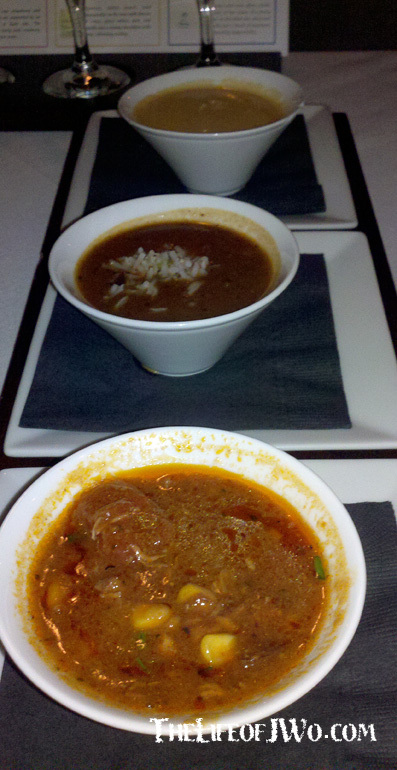 We also got the Soup Flight, which had a bowl of Lobster Bisque, Shrimp Gumbo and Brunswick Stew, which was the soup of the day. Tammy was all set to get the Seafood Flight: Soft Shell Crab, Sea Scallop, Shrimp and Grits, but decided to make her own flight after she saw the specials. She went with Shrimp and Grits, Pan Seared Scallop (Catch of the Day) and Veal Scallopini. I went with the Steak Flight: Boursin Stuffed Filet, New Zealand Wapiti Elk and the Cut of the Day, which was Bison with pickled onions and a bleu cheese demi-glaze. My Steak Flight. 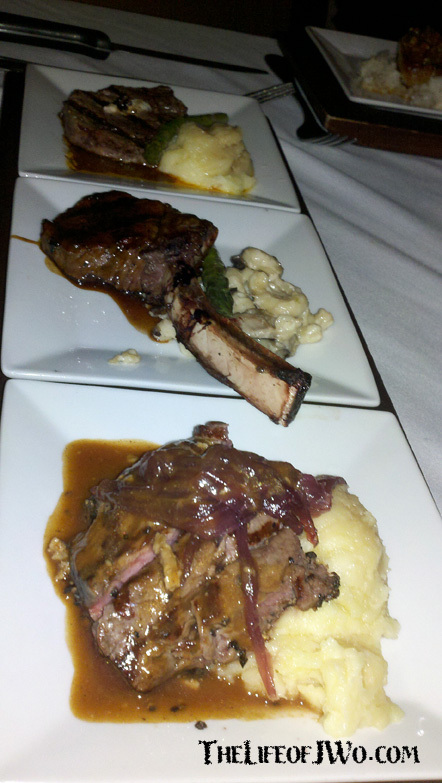 Filet (top), Elk (middle) and Bison. My pictures don’t do the food justice, because this food was some of the best I have put in my mouth, and not just since we have been to Memphis. The filet, while thin, was cooked perfectly to medium, and could be cut with a fork. The Kahlua Garlic glaze on the elk was unbelievable and there was absolutely no gaminess in the meat, which was so tender. The elk was so good that at one point I asked Tammy if it would be rude of me to gnaw the meat off the bone. I didn’t. The bison also had no gamey flavor and was cooked to perfection as well. I traded a bite of my filet for a bite of Tammy’s Pan Seared Scallop, which was the only item of hers I got to try. That scallop literally felt like it was melting in my mouth. I can’t remember when I’ve had a scallop that good in all of my visits to beaches over the years. Flight isn’t the kind of place we can eat at every weekend, not unless we win the lottery, and it’s definitely more upscale than our usual places. I even wore khakis. We took advantage of Flight’s complimentary valet service and left there with full bellies and great memories. The service is top-notch, from the hostess, to our waiter, to the guys busing the tables, we were treated like we were one of the Who’s Who of Memphis. If you live in or around Memphis and haven’t been to Flight, I highly recommend it. If you travel through Memphis, Flight is worth the drive from the airport. I promise you won’t leave disappointed. Gallery | This entry was posted in Daily Life, Food and tagged Bucket List, cooking, daily life, Flight, food, humor, Memphis, people, Postaweek2013, restaurant, Tammy, Travel. Bookmark the permalink.